Benny Glaser, a pro from Southampton United kingdom is the winner of the $1,500 buy in Omaha High Low event of World Series of poker 2016. This was event#26 of the event to which Glaser collected the first prize of amount $244,103 along with a gold bracelet. The tournament received 934 entries and generated $1,260,900 as total cash prize pool. Out of 934 players top 157 places paid out. Benjamin Gold of Long Beach, CA finished as the runner up of the game and took home a good total of amount $150,828. 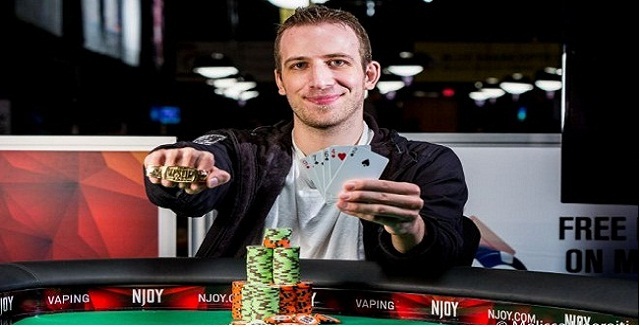 Gold now has eighth WSOP cashes to his name till date, including 3 Final table appearances, 2 gold bracelet championship titles, and total earning for the player is now $454,680. Glaser is great if we talk about Omaha High Low game. He is a genius and has proved against many hundred poker players. He was very happy and said that obviously, winning a gold bracelet in a championship like this is a massive goal and I hope to win more in near future. The event took place at the Rio in Las Vegas. Benjamin Gold concluded his journey at second place. The heads up round was good and it took time to decide the winner of the game. Gold collected $150,828 being second. Japanese Motohiro Kondo was the third position holder and took home a very good total of amount $106,070. Fourth, fifth and sixth positions of the $1,500 buy in No Limit Hold’em event at belongs to Phillip Hui, from San Antonio($75,627), Brandon Shack-Harris, from Chicago($54,680) and Zachary Milchman, from Delray Beach($40,098). Russian Ilya Krupin gets seventh place for $29,830, Max Pescatori, a four time gold bracelet winner gets eighths place for $22,517, whereas Scott Packer, a Santa Ana player got $17,250 as winning share.